is roughly elliptical in shape, with its long axis, oriented WSW-ENE, which measures 188 metres and the short one 156. The building stands on a base of two steps; above it there are three floors of arcades and a fourth storey without arches but with small rectangular windows. There were eighty arches on every floor, divided by pillars with a half column (see the picture on the right). The four arches on the axes of the building were the main entrances, and were probably decorated with a little porch and a statue. The other 76 arches were numbered for an easier access to the seats. Only 31 arches of the outer ring, from number XXIII to LIV, have remained intact. All around the rims of the first three floors there were circular promenades that could accommodate most of the public in case of rain. 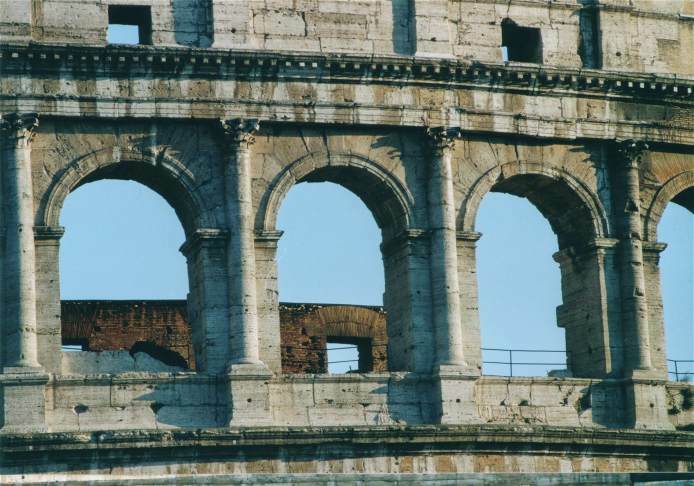 The Colosseum includes all the ancient architectural "orders", which are styles recognizable mainly by the columns employed. The order of the ground floor half columns is the Tuscan one (a Roman variation of the Doric order), on the second floor the semicolumns are Ionic and on the third floor Corinthian. 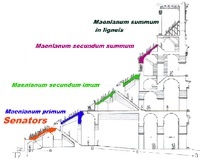 The panels of the fourth floor - the attic - are divided by flat composite (Roman-Corinthian) lesenes in place of the half-columns of the lower arcades, with a rectangular window every second panel. Ancient authors mention - and the images that we have confirm it - that a series of bronze shields (clipea) was affixed all around the attic on the panels between the windows. The arches are 4.20 metres (139") wide and 7.05 m (231") high on the ground floor, while on the upper floors they are only 6.45 m (212") high. Including the cornices between the floors and the attic, the overall height of the building is 48,5 m.
The arena where the shows took place measures 76 by 44 metres; its floor was made with wooden planks. All around the arena there was a wall called podium, about 10 feet high, whose scanty remains do not allow for a precise reconstruction. During the shows the arena covered with yellow sand (harena) taken from the hill of Monte Mario; on special occasions the arena was covered with specially coloured sand, or mixed with speckles of glittering minerals. Over 100.000 cubic metres of travertine stone (45.000 only for the external wall), quarried near Tibur (today Tivoli), were used. A road was built from the quarries to Rome for this purpose. A similar quantity of tuff blocks, bricks and opus cementicium (concrete made of small lumps of tuff in mortar) were also used, thus adapting the resistance of the materials to the loads and thrust that had to be supported. 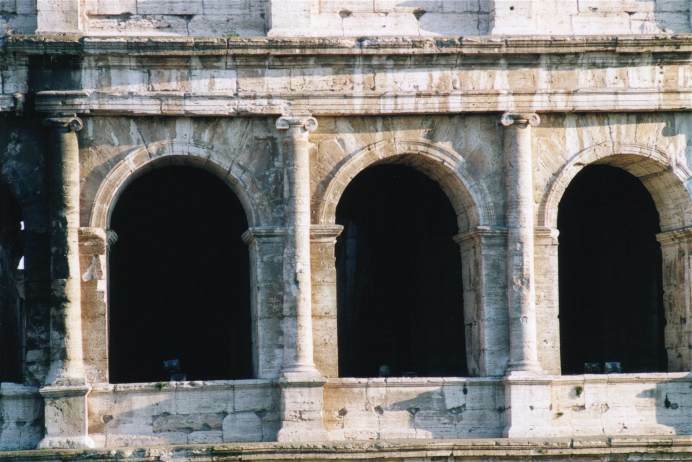 The combination of different materials improves the elasticity of the whole: the main pillars are made of travertine, radial walls are of travertine and tuff, the vaults are cast in cement work, and the walls were plastered and painted white and red (most of the stuccoes have disappeared). The passages corresponding to the main entrances were decorated with paintings and stuccoes, which have barely survived the centuries. 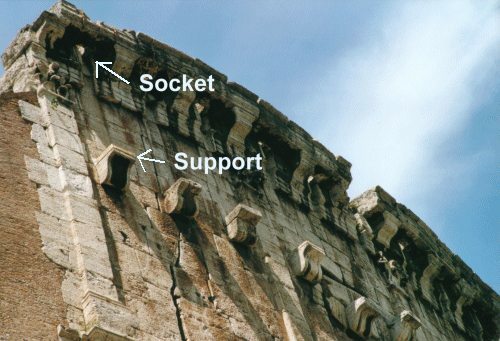 The travertine blocks were connected by iron grips that were removed a long time ago, leaving those ugly holes between the blocks. It has been calculated that 300 tons of metal were used only to this purpose. 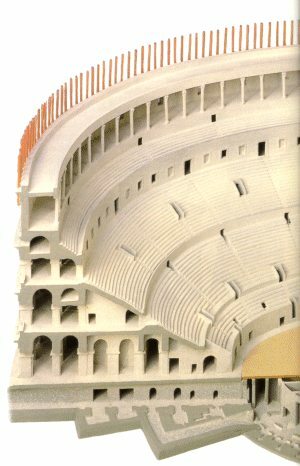 Like every amphitheatre, the Colosseum had two entrances to the arena on the main axis: the NW gate was the Porta Triumphalis, where the gladiators made their entrance during the pompa gladiatoria, the parade that took place outside and led to the amphitheatre. 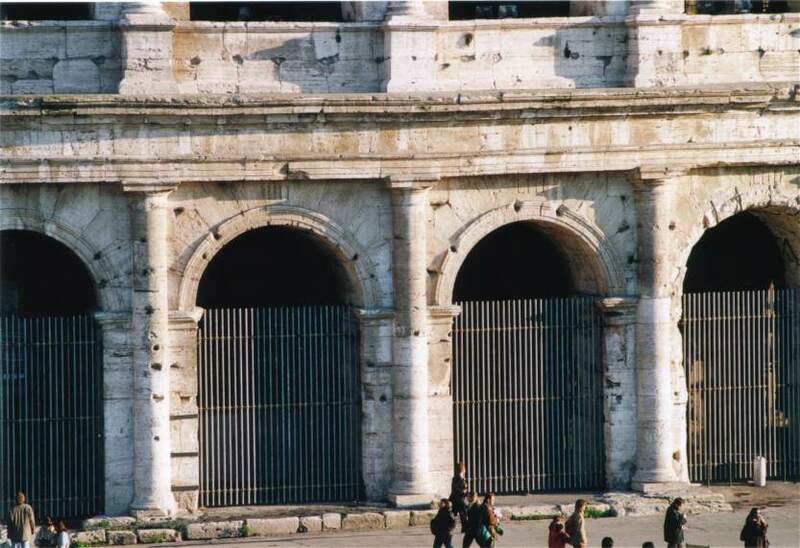 The SE gate was called Porta Libitinaria (from Libitina, a Roman goddess of death, corpses and funerals), as dead gladiators were carried through it. All around the top there were sockets for 240 wooden beams which supported the awning (velarium) that covered the spectators from the sun and was manoeuvred by a unit of sailors of the imperial fleet, stationed nearby. 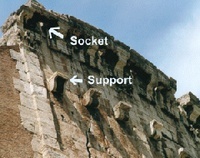 Some of the sockets are still visible today. 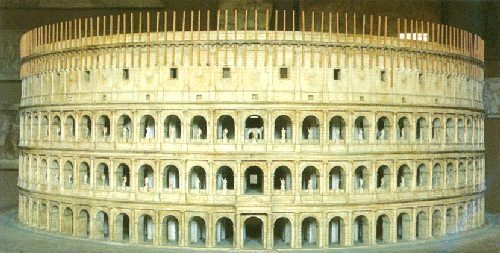 The Colosseum was surrounded by an area paved with large travertine slabs and delimited by boundary stones set in the ground with a slight inclination inwards, which are thought to have been supports of some sort for the ropes of the awning (or perhaps gates for crowd control). Beyond these stones began the street paving of big gray blocks of basaltic lava. The square around the Colosseum is probably one of the few places in Rome that is at the same level as the ancient times. Remember that Rome is about 2600 years old, and that during all this time layers and layers of buildings and roads have accumulated. The level of the ancient city is about 8-15 metres below the current one. Since the birth of Rome, the average annual growth of the city has been calculated at about 7.5 millimetres per year. But there, when you walk on the cobblestones around the Colosseum you are walking on the same stones the ancient Romans walked on. Click here for a page of maps of the area during the centuries. What is left of the original building? The north side of the outer wall is still standing (including 31 of the original 80 entrances, together with the part of the building that is between it and the inner wall supporting the top floor colonnade) and practically the whole skeleton of the structure between this inner wall and the arena, that is, the encircling and radiating walls on which rested the cavea with its marble seats, that instead have disappeared. The cavea seats were made in travertine, but now the seats are almost completely lost. The cavea was divided into three parts called, from bottom to top, podium, gradatio and porticus. In major amphitheatres, like the Colosseum, the gradatio was divided horizontally into different levels (maeniana) by praecinctiones (corridors), and vertically into cunei (sectors) by the scalaria, the steps leading to the vomitoria, the entrances. Upon entering, the spectators had to present a tessera, a tablet that reported the cuneus, gradus and locus of their seat. For example, CVN III GRAD IV LOC I corresponds to seat 1, row 4, sector 3. A section of the cavea was reconstructed during the 30s and fitted with some seats found in the excavations. However, it seems that the reconstruction is not faithful at all, as on that part of the terraces there were only three wide step where the Senators placed their personal seats (subsellia). The arena floor was made of wooden planks supported by brick pillars; some sections of the floor were removable or could slide down the underground, so that the scenarios, animals and people could emerge from beneath. 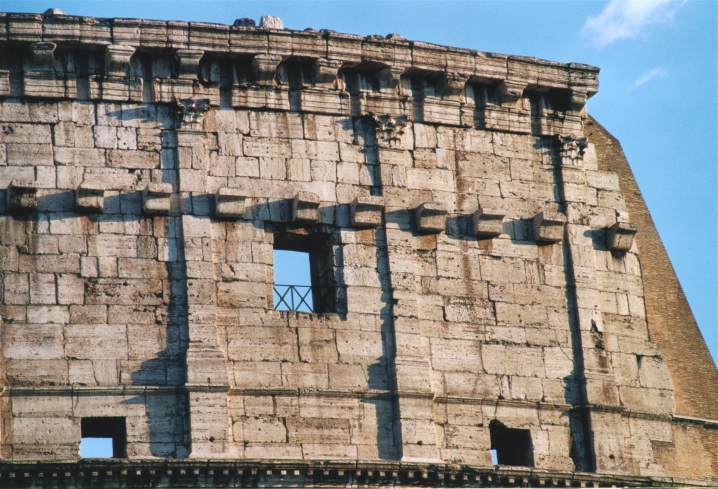 In Domitian times, some years after the inauguration of the amphitheatre, was built under the arena a complex system of walls that supported the wooden floor of the harena and organised the underground spaces that were used as a backstage for the shows. It is not easy today to understand the specific purpose of the underground spaces, which are now only partially visible, as recently a part of the arena deck was reconstructed by the Soprintendenza Archeologica di Roma, responsible for the safety of the monument, in collaboration with the German Archaeological Institute (see details). It is easy to imagine that in the underground spaces there were all the services necessary to the shows: equipment, machines, costumes, cages for the animals, storage. All around the underground, along the wall, there were lifts that could raise the animals to the level of the arena. The podium was the terrace immediately around the arena. In the Colosseum it was raised about 10 feet above it. Part of the floor of the arena was made of masonry and part of wood, with removable sections for the entrance/exit of scenarios, beasts and materials. There were marble decorations around the podium, at the entrances (vomitoria) that gave on to the cavea for the passage of the public, and perhaps also on the niches beside the main entrances on the arena. Under the arena there were all the services necessary for the shows: cages for the animals, stores, tools, and lifts that raised the beasts to trapdoors placed on the floor of the arena. When wild beasts were in the amphitheatre a fence was erected all around the podium. The fence had wooden rollers on top, in order to prevent the beasts from climbing over. Inside, the seating has a gradient of 37�, and the overall height of 48.5 m (159) was calculated to give a good view of the arena even to the spectators in the upper seats. The corridors and stairs were planned in order to allow the public, calculated between 50.000 and 75.000, swift access and exit and to keep the different classes of spectators separated. The two main entrances on the short axis led directly to the central boxes, while a series of obligatory pathways, symmetrically repeated in each quadrant of the stand, led the other spectators to their assigned places. Looking for figures and plans?